Kim Kardashian is being dispised and ignored by the elite Hollywood A-list stars she so desperately wants to join. 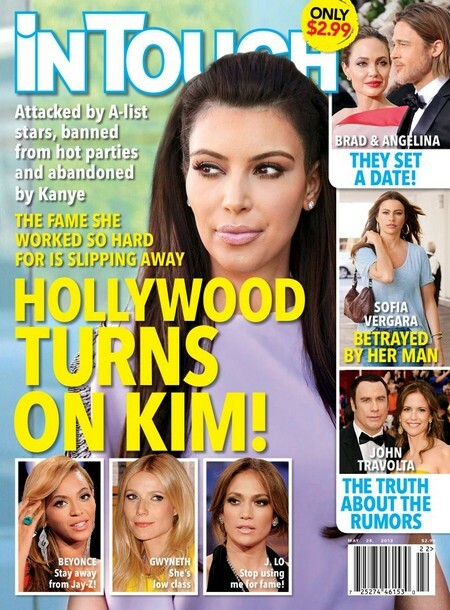 The current issue of In Touch features the cover story ‘Hollywood Turns On Kim.’ They claim that Kim is being ostracized by A-list stars who happily welcome her man of the moment Kayne West. Kim was barred at the Met Gala and got mean-girled by Vogue Editor-in-Chief, Anna Wintour. Wintour despised Kim’s blatant famewhoring and made sure she wasn’t on the 800 person list that included some of the very people Kim worships including Gwyneth Paltrow, Carey Mulligan, Rihanna and Beyonce. Kanye West showed that it’s buisness before pleasure as he attended the Met Gala – dispute that fact that Kim was snubbed. To add to Kim’s wows, Beyonce has let her know she better keep her grubby hands off of her hubby Jay-Z. Gwyneth Paltrow just thinks Kim is low class and Jennifer Lopez does not want Kim to use her for fame. Kim is learning the hard way that while she might be able to sleep with A-listers like Kanye West her promiscuity does not gain her entry to the elite.